The current strategy of reducing a person’s heart-attack risk by lowering cholesterol to specific targets is being jettisoned under new clinical guidelines unveiled Tuesday that mark the biggest shift in cardiovascular-disease prevention in nearly three decades. The change could more than double the number of Americans who qualify for treatment with the cholesterol-cutting drugs known as statins. The guidelines recommend abandoning the familiar and easy-to-understand guidance to keep LDL, or bad cholesterol, below 100 or below 70 for people at high risk—a mainstay of current prevention policy. Instead, doctors are being urged to assess a patient’s risk more broadly and prescribe statins to those falling into one of four risk categories. 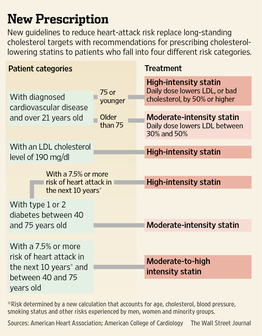 The aim is to more effectively direct statin treatment to patients with the most to gain, and move away from relatively arbitrary treatment targets that are less reliable in predicting risk of attack than is widely believed. “We’re trying to focus the most appropriate therapy to prevent heart attack and stroke…in a wide range of patients,” said Neil J. Stone, professor of medicine at Northwestern University Feinberg School of Medicine and head of the panel that wrote the guidelines. Cardiovascular disease is the Western world’s leading killer. In the U.S., it accounts for about 600,000 deaths each year, or about one in four. 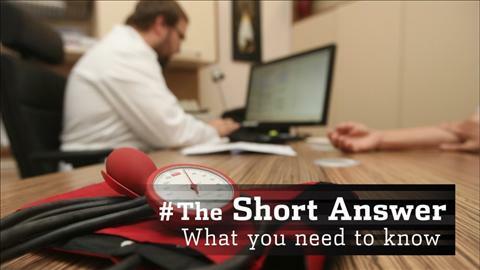 About 130,000 Americans die annually of stroke. Numerous studies show that statins reduce the risk of heart attack and stroke. But solid data demonstrating the benefit of reaching specific targets are lacking, said Dr. Stone. While lowering the LDL number remains a critical goal, the focus is on the risk reduction achieved with statins rather than the effect on LDL, said Donald Lloyd-Jones, chief of preventive medicine at Northwestern and a member of the guidelines panel. Cardiologists expect the recommendations, jointly developed by the American College of Cardiology and the American Heart Association, to substantially change the conversation between doctors and millions of patients over the best way to lower their risk of heart attack or stroke. The risk groups identified in the guidelines include patients who have already had a heart attack, stroke or major symptoms of cardiovascular disease; those with an LDL of 190 or higher, which typically has a genetic cause; people with diabetes; and anyone ages 40 to 79 who faces a 7.5% risk of having a heart attack over the next 10 years, according to a new risk score. That score—with a lower threshold than under current guidelines—takes into account cholesterol level, smoking status, blood pressure and other factors. All are recommended to take high or moderate statin doses that would result in LDL reductions of about 30% to more than 50%. If fully implemented, the guidelines could more than double the number of people who qualify for statins, to more than 30 million, the authors said. The new approach is likely to have a modest immediate effect on the pharmaceutical industry. All but one of the statins available, including Lipitor, have lost patent protection and are available as inexpensive generics. Merck & Co.’s Zetia, a non-statin cholesterol-reducer that is also an ingredient in Vytorin, could take a hit because the guidelines discourage use of agents that haven’t been proven to reduce risk of bad events, unless patients can’t tolerate the recommended level of statin treatment. Zetia hasn’t been shown to reduce bad events even though it lowers LDL. But both supporters and critics of the guidelines worry they will confuse patients and physicians, and disrupt an easy-to-understand and successful strategy. While statins haven’t been the only factor, research shows there has been a significant reduction in heart attacks and death from cardiovascular disease in the past two decades since the drugs were introduced. Having targets for LDL “gives doctors and patients something to shoot for” as well as a motivation to try to get there, said Steven Nissen, chairman of cardiovascular medicine at the Cleveland Clinic. “The elimination of target levels is going to be a huge change for physicians and patients,” he said. The authors of the guidelines say a change was needed because the numerical targets are too blunt a tool. The targets have never been tested in a clinical trial, but a review of the evidence suggested they could lead to undertreatment of some patients and overtreatment of others, doctors said. For instance, a high-risk patient with an LDL of 180 who reduces it with a statin to 90 will substantially reduce his risk. Yet under current guidelines he may be viewed as failing therapy by not getting to 70. 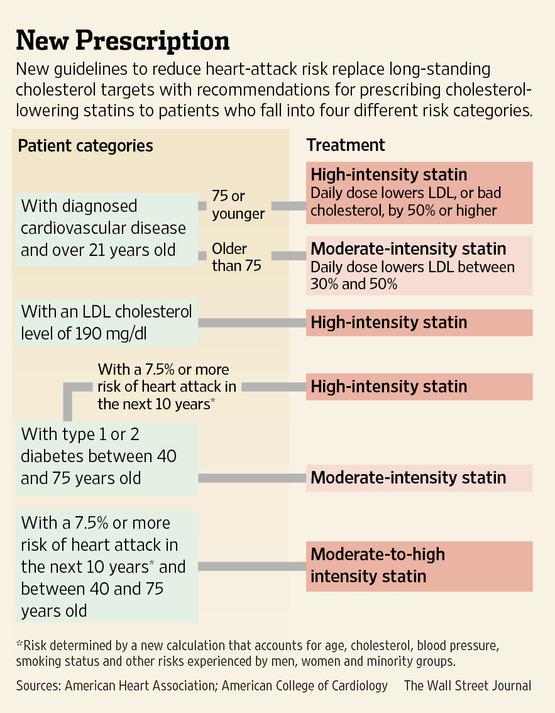 Doctors often prescribe additional, non-statin cholesterol agents for patients not reaching targets with a statin alone, but there is no evidence getting another 20 points lower would bring a further meaningful reduction in risk. Similarly, said Dr. Lloyd-Jones, an older patient who had accumulated other risk factors but had an LDL of 99 might be missed under the current strategy, even though statins could offer significant benefit. Statins “seem to work no matter what your lipids are,” said Harlan Krumholz, a Yale University cardiologist, using a term referring to blood fats including cholesterol. He wasn’t an author of the guidelines, but he has argued for moving away from LDL targets as a cornerstone of prevention. “Knowing your number can be useful in understanding your risk, but not in chasing it as a strategy to improve your outcome,” he said. Targeting LDL has been a strategy since the National Cholesterol Education Program was established to promote heart health in 1985. It became a dominant approach in the mid-1990s, after research demonstrated the ability of statins not only to lower LDL but to prevent heart attacks and death. As research linked higher doses of statins with further reductions in heart attacks, lower is better became the mantra for LDL. Now, even without the emphasis on hitting LDL targets, the guidelines are expected to significantly boost statin use, in part because they add stroke reduction as a goal and thus include more women and minorities, who are more prone to strokes than heart attacks. The researchers identified the 7.5% risk threshold as the point where the benefits of statin therapy to prevent first heart attacks or strokes clearly outweighed the risks, including muscle pain and a small risk of diabetes. The cholesterol guideline was issued with three other heart-related recommendations to guide doctors on assessing risk, treating obesity and encouraging healthy diet and exercise habits. The cholesterol document in particular is expected to generate controversy and will be discussed at a major session next week at the American Heart Association scientific meeting in Dallas.